No one can know for sure what the future of technology holds for us. Computers embedded in our fingertips? The possibilities are fun to think about, but at this point, we can only speculate about where technology is headed. One area that some people believe is due for a technological overhaul is typing. With all of the technology that exists today, how is it possible that we still need to learn to type? In particular, the growth of “Voice to Text Technology” has some students and parents wondering if it isn’t time that we phase out typing instruction altogether. Voice to text software has increased both in use and sophistication in the past several years. For those unfamiliar, this is a tool where users can speak into their computer’s microphone and the words will appear for them on the screen as they speak. Sounds cool, huh? Well it is! Voice to text platforms are especially useful for students who have either learning or physical disabilities that prevent them from typing. This digital tool can allow students to record their thoughts or test answers without needing a teacher or other student to do the typing for them. 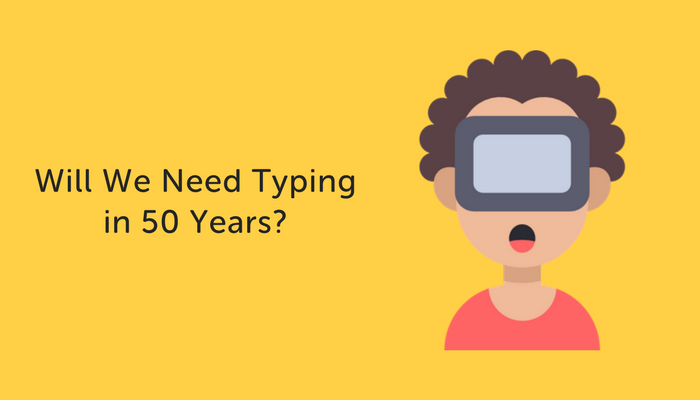 While currently, voice to text technology has fairly limited use in schools, it does have some students and parents wondering if this means that typing will someday replace the keyboard. Why teach students to type if they can achieve the same outcome just by talking into a microphone? This is a great idea in theory, but there are a few limitations to the technology that have prevented this idea from becoming a reality just yet. There are a handful of reasons why voice to text technology hasn’t (and likely won’t) completely replace typing anytime soon. The main reason is the requirement to talk, and thus make noise, in order to type. Imagine having a classroom full of thirty students who are all trying to write an essay using voice to text software. This would require thirty students to be talking simultaneously. Not only would things get very loud and very distracting, but each student’s microphone would likely pick up part of what other students are saying. And you thought students’ writing was confusing already! A second reason that voice to text technology has yet to replace traditional typing has to do with accuracy. As the technology currently exists, voice to text transcriptions tend to have errors, and the process of revising text or going back and changing something that’s been recorded is more complicated and cumbersome when you aren’t using a keyboard. Teachers try to instill in students that good writing is a process, of which revision is a key step. Using software that makes revision a challenge doesn’t support this teaching philosophy. A final reason why voice to text technology is unlikely to replace typing anytime soon has to do with confidentiality. Increasingly, states and districts are having students take standardized tests on computers. These tests often include an extended response component. If students were to read their answers aloud as opposed to typing them, it would be very hard to ensure that one student wasn’t listening to another’s answers. The same goes for the workplace. How comfortable would you be if every email you composed you had to read aloud within earshot of your coworkers? In order for this to happen, both the technology itself and our organization of classrooms and workspaces would need a serious overhaul. So in the meantime, keep your eyes on the screen and your fingers on home row! human society needs more varied food. And games. VIDEO GAMES ALWAYS!!! Excellent article. However voice to text technology doesn’t always work. It demands that the student speak loud and clear and some words it doesn’t understand. I think it all depends on the students accent. It also doesn’t always keep up with the speaker in other words it’s slow. Typing is a much faster outcome. Interesting thoughts. I hold a different viewpoint. There are quite a few things that have been done in schools long after they were no longer useful in the modern workplace. Further, with students increasingly using smartphones, I would not be surprised to have schools move to a model that includes both speech-to-text and some form of touchscreen typing. How long will this take? I don’t know, but with so many jobs now just needing an onscreen button press to do something that used to take multiple words to do, I do not see touch typing as being a skill that will continue to be in as high demand as it once was. i didn’t read the whole thing but i read most most of it.